This is the direction for you to sit FACING when you are making decisions, negotiating contracts, working on important projects, etc. Add together the last two digits of the year you were born. If the result is 10 or more, add the two digits together to reduce them to a single digit. If this result is 10 or more, add them together again to reduce to a single number. If your answer is 5, use number 8. If your answer is 5, use the number 2. 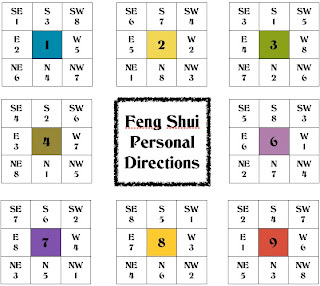 Find your personal feng shui direction number on the corresponding guide above. These are your personal directions. Health. Healing Energy. Good Fortune. 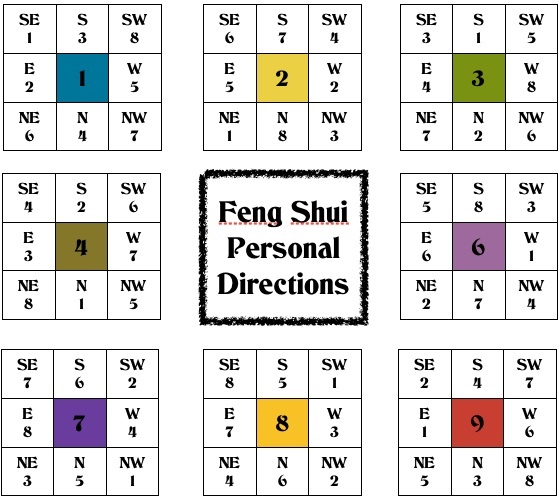 PLEASE NOTE: In Feng Shui, there are no wrong or right ways. There are inexpensive cures to remedy a situation that could use improvement. If you have found that your desk or bed faces the wrong direction, email us for some ideas on how to better enhance your personal direction. EXAMPLE: My own desk faces one of my negative energies, but I have found an inexpensive cure (under $5!) to “fix it”.